Designer Kenneth Cobonpue recently debuted a gorgeous set of Dragon Tail Lamps, which look both dangerous and delicate at the same time. 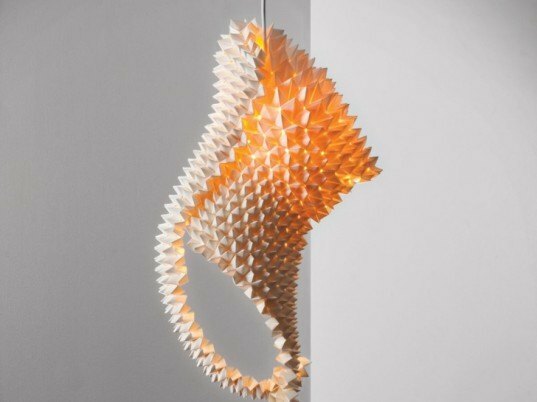 The lamps are made with chromed origami paper and they taper to small curve at the bottom resembling a prickly tail, brining an edgy twist to the soft glow of light they emit. Inspired by his homeland in the Philippines, Cobonpue integrates locally sourced organic materials into his designs including palms, seagrasses, bamboo, abaca, and rattan. His trademark hand-made techniques are reminiscent of his mother’s designs, who also owned and operated a well-known furniture and design company in the seventies. The lamps are available in white and parchment and come in various suspension and table varieties, making them fantastic focal points for modern interiors.